How it looks: While retaining the easily recognisable octagonal Kaweco shape in the cap, this pen is quite a departure from the look of their existing lines with some natty new bright colour combos, and is a goodly size rather than a pocket pen. It’s available with a Fine or Medium nib. How it feels: It has a triangular grip, so if you like a Safari then you’ll like this grip too. It’s really light to hold, and perfectly suited for endless hours of essay-writing. How it fills: The pen comes with three Kaweco cartridges and you can even stash a spare ink cartridge within the main body for emergency refills – or you can use a standard fountain pen converter filled with the ink of your choice. Crucially, how it writes: The pen itself gives a little scratchy feedback but can also deliver some line variation with that Kaweco nib, but you do need to give it some pressure. Pen! What is it good for? 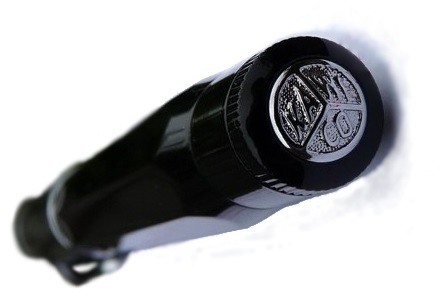 : Students, pupils, or anyone who just wants a lightweight, different-looking fun pen, really. 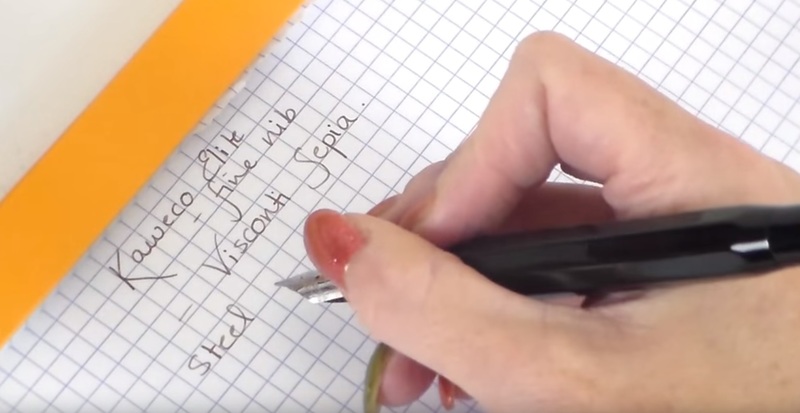 VFM: Sure, you can get less expensive pens from the far east, but this is a real German-made pen and you can have all that history and fountain pen experience for about £15. It represents very good value for a European pen. If this isn’t quite your cup of tea … you could try a Lamy Nexx fountain pen, which is at a similar price point and comes in a wide variety of fun colours (although it will only accommodate proprietary cartridges and converters, so bear that in mind). Where to get hold of one: Most good on-line fountain pen retailers stock the Perkeo; see Kaweco’s own site for a list of retailers. Ant’s review at UK Fountain Pens. Mathias’s Bleistift blog, which reveals the mysterious link between the Perkeo and BBC TV’s cult comedy classic Red Dwarf. Alison’s historical investigations to find out who the heck Perkeo was in the first place, at Her Nibs. Thanks to Kaweco for the samples that Alison and Scribble tested. It’s traditional for our meta-reviews to start with a little bit of history, and it’s just as well that this isn’t one of those, as Nuremberg is quite incapable of delivering history in little bits; it provides it in great big monumental slabs. So, let’s get the architectural introductions over with; from the Sinwell Tower, a remarkable medieval survival, you can look at pre-war and post-war photographs of the city landscape then admire the rebuilding job in front of your very own eyes. The one area which nobody was in a much of a hurry to rebuild was the parade-ground used for those 1930s rallies, but thankfully some much more positive uses have been found for that space – and last weekend your dogged United Inkdom correspondent dropped-in on two of them. 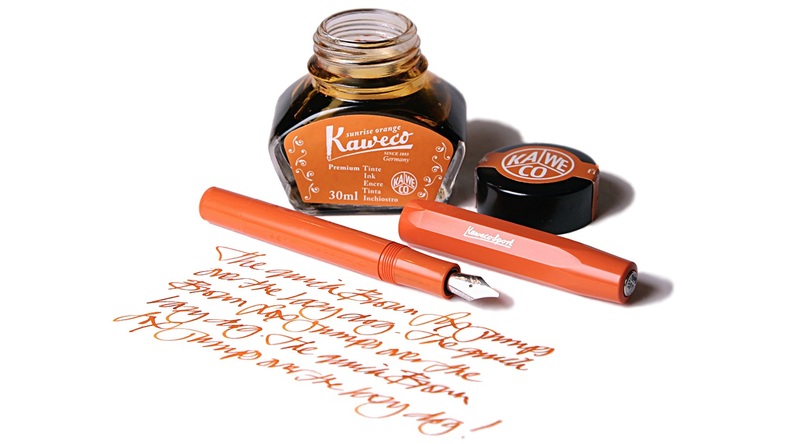 First up, of course, was a visit to Kaweco, who really have their ducks in a row – and we’re not just talking pocket ink flasks there. Michael Gutberlet, head honcho himself, gave a guided tour of facilities at Thomas Mann Strasse and Max Brod Strasse (all the roads are named after liberal German-language literary figures), and this could happily have occupied most fountain pen fans for a whole day. Seeing the assembly and dispatch operations was interesting in itself, but the highlight was inevitably Michael’s own collection of Kaweco antiques, some stretching as far back as the 1880s. The tray below, charting the morphology of the Sport model from 1911 onwards, is a good example of the ‘design DNA’ evolving over a century. The solid silver prototype of the Sport which may follow next was impressively heavy too! Raiding the pen archive also helped to solve another mystery which had plagued those of us more acquainted with English-language literature, viz why the Lilliput model is missing its second letter L. How the mistake happened is lost to history, but just visible on the original version of this model pictured below is the engraving which shows the spelling as LILIPUT – so retaining the error is at least staying true to tradition. A short walk north through Hans Fallada Strasse (referring to an author who has only recently been translated into English – a tragic but riveting read) was the Exhibition Centre, our main destination. Also home to Spielwarenmesse, the annual Nuremberg toy fair, for the last few years it has hosted the marvellously-named Insights-X. This is a diverse stationery show rather than just a pen-focused event, but there was going to be plenty to see and, just as importantly, the organisers help to get a few bloggers there too. Part of the blogger experience is a guided tour (with translator, if needed) of a number of stands for which exhibitors wanted a brief captive audience. For the German and Austrian calligraphers (and one British scribbler) present the relevance of wares varied, with slightly more which was aimed at the children-and-schools market than we quite knew what to do with. But let’s be honest, who can really object to being introduced to parrot knapsacks and flamingo pencils? After the guided tour, there was just time to meet up with a few more firms who will interest United Inkdom readers. We made further introductions to the splendid Super 5, got in touch with Turkish pen company Scrikks for the first time (reviews to follow), and got a sneaky early view of Cleo Skribent’s forthcoming Optima model – which will replace its current ebonite piston-filler next year (we will try to cover that here too, if we can get our hands on a sample). So, there are lots of pens and products which we’ll probably be reviewing over coming months, and you’ll be seeing plenty more blog items and articles flowing as a result of the trip. The other really good thing about this sort of experience, though, is meeting fellow enthusiasts – a real delight, even with a few language challenges to overcome. Stand by for laboured pun… Rather like Nuremberg’s castle, the pen blogging community evidently has a deep well of talent to draw from! A little bit of history Are you sitting comfortably? The history here is a quite a long one. When Padraig was kidnapped by pirates and taken to slavery in Ireland – prior to his subsequent visit which, in the long run, elevated him as Saint Patrick – some accounts record that his sister Lupita was carried away with him. Her life story is obscure indeed, but somehow legends ascribed to or connected with her found their home at the edge of Lough Ennell. What may have been an isolated area of the now-drained bog at the edge could conceivably been named in shaky Norman French as L’Isle de Lupita, but this too is conjecture; somehow, nevertheless, the name was corrupted to Lilliput. Many centuries later the Dean of a cathedral – St.Patrick’s Cathedral, as it happens, for in our world all things are connected – was staying by the lake when he looked across and saw tiny figures, diminished by perspective, on the far side of the shore. According to literary legend, there an idea was born; for that Dean was none other than Jonathan Swift. A little bit more history Jonathan Swift was a rapier-sharp satirist in his time (see ‘A Modest Proposal‘ for his critique of the way some governments behave towards the poor), but his best-known work these days is a rather subtler satire on tribal folly, Gulliver’s Travels. Lemuel Gulliver’s first port of call, of course, is Lilliput, where the people are astonishingly diminutive – around six inches in height, typically. If the fountain pen had been available at this point, a good century and a half before its invention, the proportionate writing implement for a true Lilliputian would have been about 1cm in length. In setting out to make an exceptionally minuscule fountain pen it is greatly to the relief of all diligent scribes that Messrs Koch, Weber and Company of Nuremberg, late of Heidelberg, aspired to virtues beyond mere portability… How it looks Oh alright, it’s still tiny – just not quite as tiny as that! This simple metal tube (well, simple in most versions, at least) is the smallest serious fountain pen currently in production. It looks small and, at least in basic black, inconspicuous. Unscrew the cap, screw it onto the back to extend to the pen’s full length, and it looks a bit more like the pen concept we’re all familiar with. Then different finishes separate the subtle from the unsubtle; the plain black aluminium gives way to flashy pink and purple versions, encounters with flame-throwers turn the stainless steel version into ‘fireblue’, and the rippled finish of the ‘brass wave’ turns a basic pipe into something which looks like it just fell out of a grandfather clock. There’s a lot of visual variety for such a small pen. Oddly, a typographical error misses the third ‘L’ in Lilliput from the barrel imprint, but Swift’s own spelling was so haphazard that he probably wouldn’t mind too much. How it feels Did we mention this thing is small? It really feels it! For most of our reviewers, the Lilliput is ideal for a light, unobtrusive pocket pen which does a good job of taking quick notes. One of our reviewers found it too small to do anything much with, while another actually wrote an entire examination paper with one. This is certainly a size and shape which divides opinion quite sharply. How it fills There is room for a small international cartridge in the barrel, and that’s all. Kaweco’s new small converter does fit into the section, but with little free space in the barrel the piston cannot be safely pulled far enough to get more than about 0.1ml drawn up, so that’s unlikely to be helpful. Thankfully, a wide range of decent tints are available in cartridge form these days, including all ten of Kaweco’s own inks, and refilling an empty cartridge from a bottle with a syringe is fairly straightforward. Crucially, how it writes… As ever, that depends upon the nib you choose. The Lilliput uses the same nib as most other small-ish Kaweco fountain pens including the Sport, Student, Special and Dia, and the whole nib, feed and collar assembly is a simple screw-fit so you can swap and change to your heart’s content. The standard steel units are usually pretty good, and if the quality consistency is perhaps not quite as stellar as that achieved by Diplomat and Faber-Castell, the enthusiastic and friendly customer service more than makes up for it; no Kaweco pen owner is left for long without a pen they can use, in our experience. The gold-coloured nibs work similarly well, while the black-painted nibs tend to run a little drier but can be coaxed back into life by refilling with a very wet ink, such as KWZ. If you really want to go crazy and spend more on a nib than you did on the pen, you can even fit one of the excellent gold nibs – and those are indeed not cheap, but Bock gold is very reliable. Pen! What is it good for? For most people, this is a trusty little stand-by pen to write quick notes with. True eccentrics (sorry, Jam) will write reams with the thing, but it’s a free world and we love the variety! VFM This depends upon the finish you go for, and how far it fits your writing style. The brass wave and ‘fireblue’ versions do take considerable expertise and time to make, and are priced quite reasonably for what they are – but perhaps only represent good value if you are actually going to use them. The more basic aluminium versions are incontestably good value as robust but real pocket fountain pens. If this isn’t quite your cup of tea, but almost… Buy a bigger pen. Seriously, there is very little of comparable size and quality in the current market. There are some tiny vintage pens, which you may find if you’re lucky, and some other cheap and rather less durable pocket pens from a few other manufacturers are still around, but if you want an ultra-small pocket fountain pen which will last the distance this is probably the best option. If you like the minimalist shape of the Lilliput and just want it scaled-up for comfort in the hand, however, you might consider its larger sibling, the Brobdingnag*. Our overall recommendation If you have a need for a pocket pen and are determined to avoid the wretched Ballpoints of Blefuscu, Lilliput is the destination for you. One contributor to this meta-review’s team is returning their sample as too small for their needs, but probably a good half of our bloggers have a Lilliput tucked into a pocket somewhere. Pick up a friend’s before you buy, test-drive one at a shop, or purchase one from a dealer you can trust to take it back if it’s just too, errm, Lilliputian for you. Where to get hold of one Any number of fountain pen specialist sellers – in fact, nearly all of them – carry the Lilliput. However, the purple, pink and champagne versions are only available from Mostwanted Pens. Thanks to Kaweco for helping with access to several of the Lilliputs we reviewed – some of which we couldn’t let go of. *The Brobdingnag is now marketed as the Supra, the original Swiftian soubriquet having proved a little long even for this barrel. ‘Cracking pen, though.